We develop PTFE carbon filled ring as per the requirement of the client. - Size Range - 10 mm ID to 500 mm ID to 15 mm OD to 600 mm OD and Thicknesses Ranging from 1 mm to 6 mm or any Thk..
- 5 Lacs to 1 Million Rings per Month. 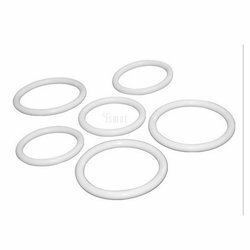 Keeping in mind the varying necessities of our patrons, we are readily involved in bringing forth a comprehensive variety of PTFE O Ring. Keeping in mind the ever-evolving needs of our clients, we are devoted towards offering an optimum quality array of PTFE O Ring. Owing to our enriched industrial experiences, we are committed to providing a wide variety of excellent quality PTFE O Ring. - These rings are chemically inert to attack by most chemicals and acids except alkali metals and certain fluorinated materials at elevated temperatures. Manufacturing s per customer’s specifications and drawings upto 1500 MM Dia. 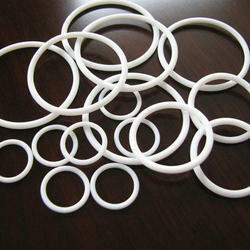 We are Manufacturing a vast quality range of PTFE O Rings. These are used in mechanical seal for chemical and thermal resistance. Our products are as per international quality standard. Offered range suffer from high friction and have limited resistance to aggressive chemicals and gas permeation.